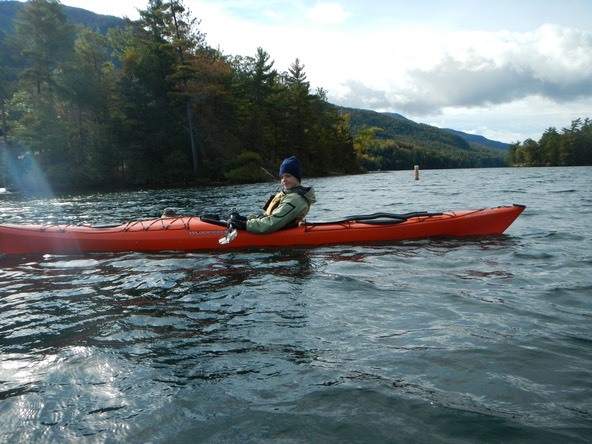 For the past seven years a changing group of paddlers, most of them veterans of many Great Hudson River Paddles, have planned a last kayak camping trip of the season over the Columbus Day Weekend. The core of the group has been Bruce Romanchak, Alan Lovgren and myself until I moved to Florida in 2010. Various other folks have joined us over the years. This year's group had a lot of repeaters and a few faces new to this event (Warren, Dan, Robin and Kaare), but still old friends. 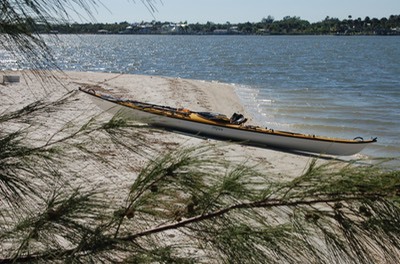 Our group of eleven paddlers ranged in age from sixteen year old Nate to almost seventy year old Yackman and came from all over the East and South. 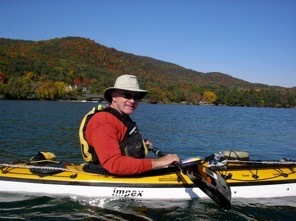 This year the group would paddle on Lake George in the Adirondack Mountains of New York State (see sidebar on the Adirondack Park). We met in Huletts Landing at the marina on Saturday morning. Huletts Landing is a small isolated hamlet on the eastern shore of Lake George (see sidebar). The weather was overcast and cool but not cold as we loaded our boats for the long weekend trip. However, it began to rain as we launched our boats for the paddle to Saint Sacrament Island, our camp site. 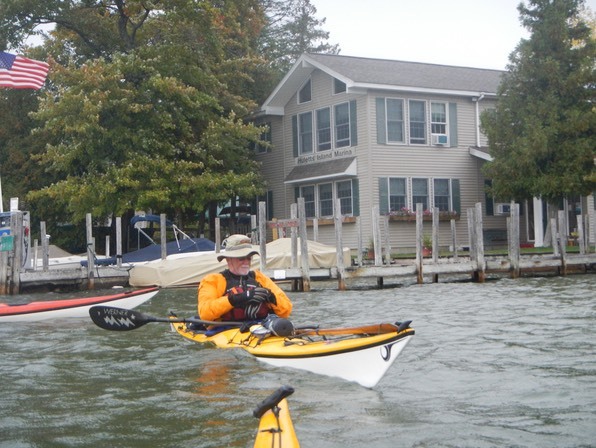 It rained lightly throughout our three mile paddle to the island, but stopped as we arrived at the island. This let us set up a dry camp which we all appreciated. There is one good take-out at St. Sacrament, a large flat rock ledge with a shallow sandy area at one end. It is our practice to put four people on a loaded boat to carry it out of the water, especially in conditions such as this. This is not because of weight, though that is a consideration. There are the macho few who would and could do a two person carry. The issue is that in rocky, slippery conditions, four on a boat protects haulers from injury should one person slip and go down. One carrier is placed at the bow and one at the stern, with two others on each side of the cockpit. Bow and stern paddlers lift with a hand under the bow or stern of the boat, not the lift toggles. Some folks balk at this arrangement, but it has saved my hide more than once (Thank you Scott Keller). The rest of the weekend involved enjoying camp, hiking on the island, good food, good company, the renewal of old friendships, and of course, paddling. My thanks go to all the participants, but especially to Bruce who organized and coordinated the weekend. The video below is done mostly for the participants, but you may enjoy it too.